One of my weakness is salty and crunchy, I could easily polish off a whole bag of kettle chips in one sitting. However February for me is alcohol and junk food free so I needed an alternative. Nothing will quite every beat the salty crunch of a kettle chip but these are enough to put the craving to bed for at least the month of February. Use these variations as a guide line as all sorts of concoctions would work. You'll need several baking trays line with baking parchment. 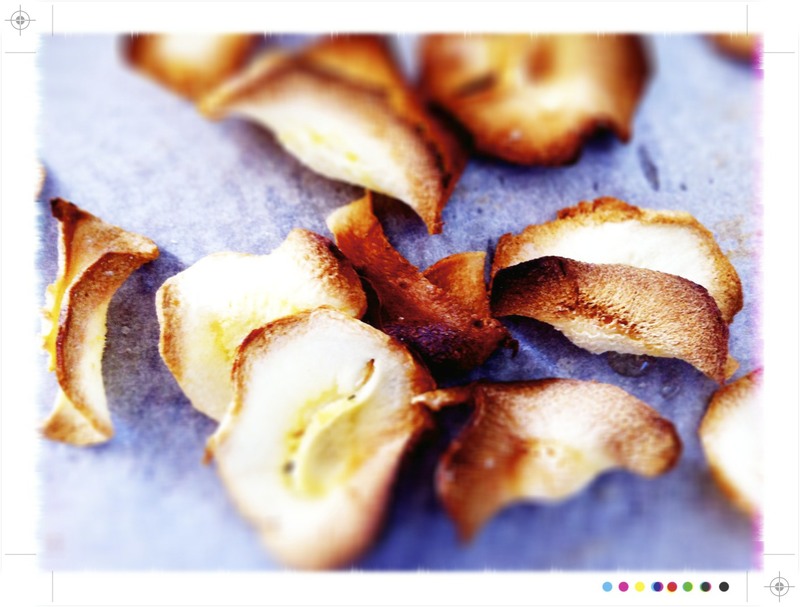 Thinly slice all the vegetables, either by hand, on a mandolin or on the thinnest slicing setting on a food processor. 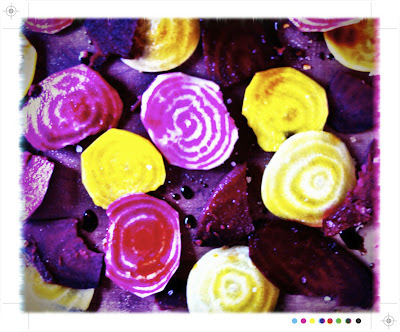 Keep all the vegetables in separate piles and leave the red beetroot to last to save on washing up in between as the red ones will bleed their wonderful magenta hue. Work on a bit of a rotation so while a couple of trays are baking you can prepare the next couple of trays. Next up parsnips and carrot. Thinly slice and place on to 2 baking trays. You can place the slices really close together as they will shrink to half their size. 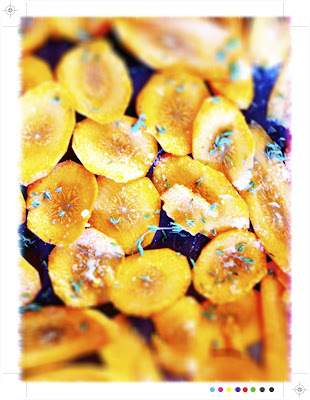 Scatter a little thyme over the carrots. Season with a little salt and spray both trays of vegetables with a little oil and pop them in the oven for 15-20 minutes* until well roasted. 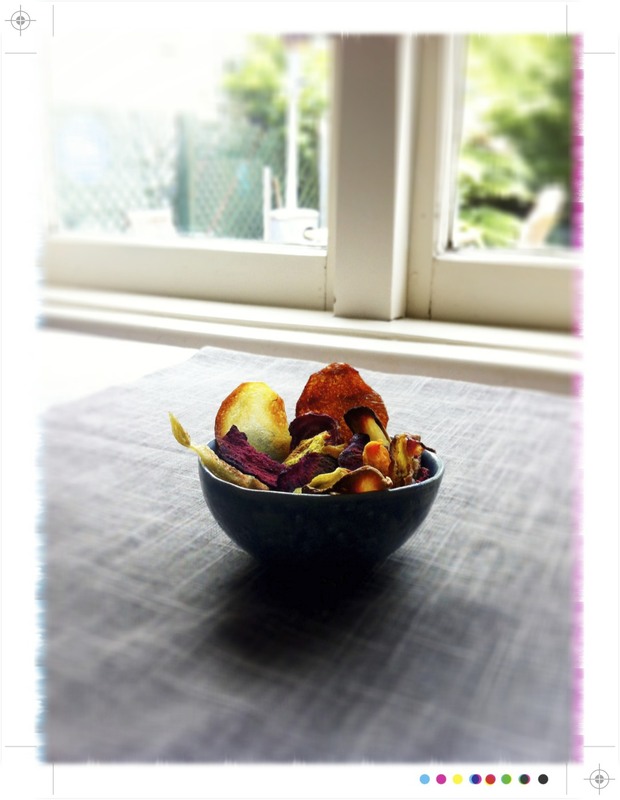 Remove form the oven and allow to cool before adding to the potato and kumara chips. Lastly lay the beetroot on a line baking sheet and drizzle with a little balsamic vinegar. Sprinkle with salt, spray with a little oil and place in the oven, again for 15-20 minutes until crispy. Remove from the oven, cool a little and add the the bowl of vege chips. *10-20 minutes is a general indication. 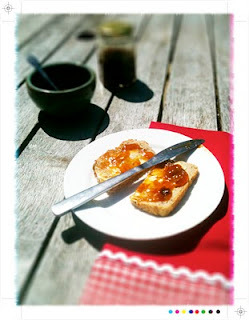 How long will depend on your oven, if you read my blog often you will know mine is almost an antique! My thoughts would be that an efficient, younger fan type model would be significantly quicker than my old lady! 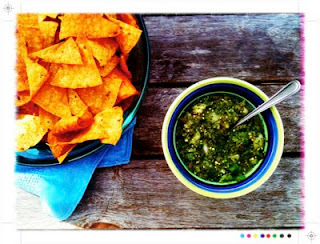 So keep an eye on them, especially for the last few minutes of cooking as crisp and golden can quickly turn to blackened. Sadly lost half of my sweet potato chips. 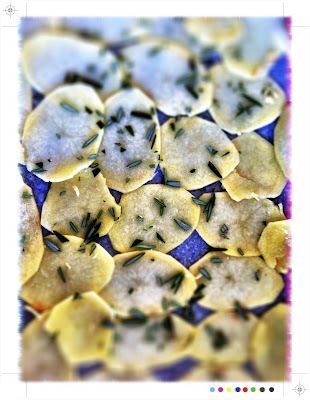 Needless to say the rosemary potato chips were my favourite, bearing the most resemblance to the classic kettle chip. Crispy, salty and a little herby from the rosemary. The sweet potatoes, well the ones that weren't burnt also worked out a treat. Good and crispy and the chilli adding just a little heat to the sweetness. Parsnips, again lovely and crispy and their sweetness coming through. Both the beetroot and carrot chips were great too. 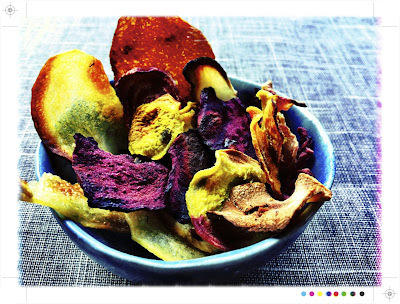 The beetroot chips earthy and sweet, the carrots sweet with a herby note from the them. They lacked the crispness of the other vege chips but place them all in a bowl with all the other vege chips and you have a vibrant, flavourful alternative to their deep fried relatives that will keep me on the straight and narrow for the next few weeks. Oh a girl after my own heart - I can polish off a bag of kettle fries without any effort at all!! 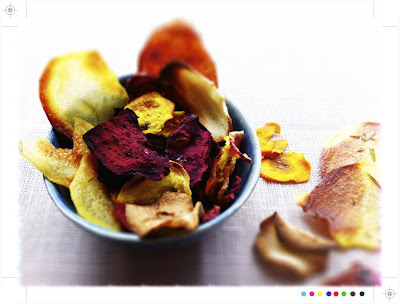 But I love vege crisps like this as an alternative too - beetroot are my favourite. Oh yes so easy to polish off a whole bag....not much beats deep fried, salty crispiness! I like the sound of these ! Yes better than the bought ones, and more classy too :-). Thanks Alessandra, still love the bought ones though! What a great idea, Mairi! I abstained from alcohol for about three weeks, and starting again did not make me feel good. I am going back to the abstinence during the week and imbibing for weekend. Oh I love cheese too! Still haven't tried kale chips but I must! I am back to imbibing too.....and enjoying it quite a lot....in moderation of course! As definitely felt the benefits of abstinence!! These look like the perfect home made comfort food for a girl like me. I'm such a glutton when it comes to crisps.